Josh is a 15 year old coder, passionate about sharing his skills with others. He is the creator of EduBlocks, an open source drag and drop version of Python 3 which allows students to learn the Python syntax with minimal errors. His software is being used in countries all around the world by students and teachers alike. Josh delivers numerous workshops around the country sharing his passion for coding to people of all ages. In 2017, he was awarded a John Pinner Award at PyCon UK for his contribution to the coding community. He is also a pi-top futureCHAMPION. 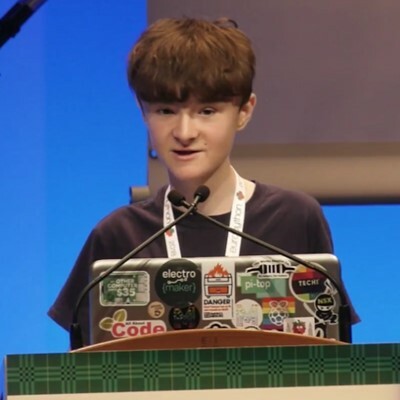 In this talk, 15 year old software developer Joshua Lowe, will talk about his journey building an open source project. Josh has been running his open source project, EduBlocks, for 2 years and has learnt many things along the way. This talk will discuss the benefits of going open source, why open source may be a good idea for your project, the problems of making your project open source and advice for people who may be interested in building an open source project or may already be maintaining one. As well as discussing open source projects, Josh will talk a bit about his project EduBlocks, which is a visual block based programming tool that he has created to help teachers introduce programming languages, like Python, to children at an earlier age. It's being used in over 120 countries across the world in schools, homes and more!